What has been described as the world’s largest crane will travel from Europe to Somerset very soon – and it will need it’s own rail track and 280 trucks to do it. Built by Belgian firm Sarens, the SGC 250 has been built specially to help with the huge development project at nuclear power station Hinkley Point C near Bridgwater. The monstrous crane, which will be officially unveiled in November, has a lifting capacity of 3,000 tonnes and a maximum load moment of 250,000 ton-meters. As reported by Somerset Live, it also has a maximum boom length of 160 meters, and will travel along six kilometers of rail that is being laid for it at the site. The SGC 250 will be mobilized overland from Ghent in Belgium to a nearby laydown yard before it is shuttled to the project site. “Hinkley Point is an extremely prestigious project, not only in the UK and Europe but also globally,” said Sarens project manager Mark Rowlands. 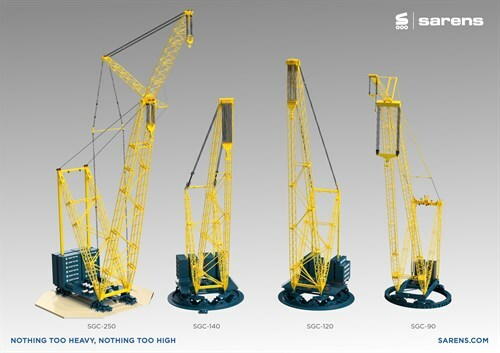 A Sarens spokesman added: “Sarens is bringing the specialized knowledge and financing to design, build, and operate such a large crane, which will soon be the largest SGC in the Sarens fleet. “Once on site, the SGC 250 may need to perform lifts at night, using an anti-collision system. This would be done to minimize disruption during the day when 52 tower cranes will be operating at the work site. There are few details on when and how the parts will be transported across or when.